It’s a rule to get a haircut before school starts, right? Of course not, but your child will thank you. If you make your appointment before the last minute rush, your stylist will thank you as well! If you have items from the previous year don’t forget to check what you already have to save you from buying multiples. Did you store them or create a supply station last year? It’s not too late. Make a game and send the entire family on a scavenger hunt for supplies hiding in the house (HINT: look inside birthday goodie bags too). Help your student to stay focused by having a space for them to go with supplies they will need (paper, pencil, calculator etc.) readily available for quick, easy access. This is one of my favorite organizing tips I give to families I work with. Do you have an entire box or drawer full of papers and artwork from the previous year? Most families do. Get with your child and go through the memories. 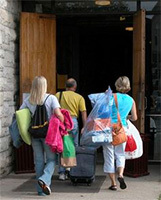 Decide what items you will keep and what items you will share with friends or family. Family members will love to get these, even as gifts. If you have ever been to registration, you know you walk out with an arm full of papers only to return home not knowing what in the world to do with all of it. No more worries, I have a solution for you! Start an active file box to keep the papers you need regular access to. An active file box (I call this a TICKLER FILE as it tickles your brain into remembering), in the kitchen to keep papers and information (schedules, teacher emails and phone numbers) handy. I always clear out the previous year before the new year starts to be prepared. I’ve made many a mom these priceless files near their Command center. Do your kids come home from school, throw their things everywhere, then sprint to the kitchen like they have not eaten in days? Mine did! I needed something to keep them on track with what is expected of them since they seemed to lose all sense of reality after stepping one foot out of the school doors. This back to school afternoon/evening routine0checklist shows everyone what needs to be accomplished each night so we are prepared for the next day. You can put it in a frame and use a dry erase marker for continuous use. I will post other charts soon. If your child packs a lunch for school, begin by purchasing those lunchbox items and storing them close together for easy to grab access. The easier it is to find, the more efficient your little one can be to pack their own! Labels in the fridge or pantry are ok to use. I saved the best for last… especially if you have teenagers! I myself had 2 growing boys who want to stay up late then sleep all day so the first several mornings of school are a little rough. If you can, start preparing a week prior to school to get a more routine sleep and wake schedule. The teachers will thank you for this as well! Freshen up summer shoes with a quick wipe. Your closet will appreciate it! 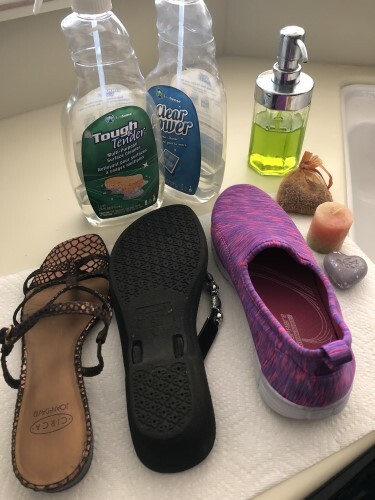 Another way to freshen: unused “too” perfumey soaps/candles/sachets you don’t like – place near your shoes; fabric softener too! This is a transitional weather month; dressing for both warmer and chillier weather, we can forget what we wore when we place a garment back in our closet. If you swap out and bag up your clothes by season or just move them around and keep sweaters in your closet, this may be helpful! How will I remember what sweaters to dry clean in a month? 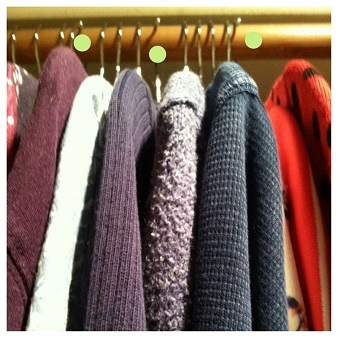 See the 3 hangers with green dots…the heads have been turned to remind myself I’ve worn them while its still chilly. Then I remember what I’ve worn & what is clean before putting them away for next year. Saves $$ on guessing about dry-cleaning bills, not to mention ‘lil nibbles on your woolens. Replace summer blooms with fall mums/annual plants. Cover perennial beds with two inches of mulch. Turn vegetables under along with compost material. Scrub away mildew on the deck, porch, and siding. Clean, drain, cover, and winterize the pool. Remove lawnmower oil and spark plugs and perform routine maintenance. Gas up and prepare your snow blower for winter. Check your downspouts whenever you rake leaves. Clean out the gutters after most leaves have fallen. Vacuum refrigerator coils and heating vents before turning on the furnace for the season. Clean windowsills and screens, and repair or replace any that are torn or broken. Check for drafts around doors and windows, and add door sweeps or window sealant as needed. 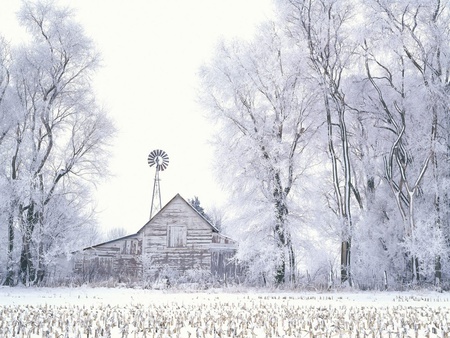 Have your chimney and furnace inspected. Change the batteries in each smoke and carbon monoxide detector on the day you change the clocks.